He is 30 years old, an age when many men in his sport are just peaking. He has a career Grand Slam, ATP Tour and Davis Cup combined record of 806-173, an astonishing 82 per cent win record over a career spanning 16 years, and 69 career titles to show for his efforts. He has won 14 Grand Slam singles titles, an Olympic Gold, four Davis Cup titles, and is third on the all-time list in tennis earnings. And yet, quite amazingly, his sporting obituary has already been written more often than for any tennis player in living memory. This is what Roger Federer said in Perth on Monday when asked about who is the toughest opponent he has ever had to face. Rafa Nadal is a once-in-a-generation phenomenon. Even if the sobriquet attached to him is borderline insulting, given the sublime genius that he is with a Babolat in his left hand and an unquenchable thirst to win in every pore on every court, the ‘King of Clay’, will take it, just as long as it’s accompanied by the No.10 inscribed at the back of his tennis shoes, as he holds up the Roland Garros trophy this year. He is special not only because he puts 100 per cent of his battered body on the line every time, and uses his divinely gifted abilities to rise above the best, but above all, for his mental strength. And that last sentence explains the premature sporting obituaries. Rafa pushes his body to its natural limits, and often, well beyond it. That unbelievable return, that superhuman lunge, that brutal down the line passing shot, that delicate volley at the net, followed by that impossible drop shot that hits the corner and canters away into the crowd – it’s all of these that make up Rafael Nadal. And all the time, those damaged knees are pounding away the miles around the court. When the knees are patched up and holding up to the abuse, his wrists give up from being subjected to those impossible forehand angles that he returns the ball from. 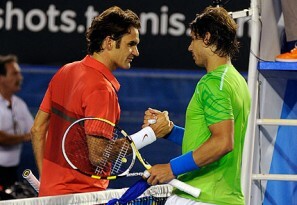 At the Mubadala World Tennis Championship in Abu Dhabi last weekend, Nadal was back hitting those forehands. He beat Berdych in the quarters, Raonic in the semis and Goffin in the finals. And the final point of the Championship was a scorching forehand winner. The Abu Dhabi event is an exhibition event, but the intensity has always been at the highest level. It also has a special significance for Rafa. He has won four of them – 2010, 2011, 2016 and 2017 (assuming an early Jan end for each tournament). But the closest parallel is with 2010. In 2009, Rafa pulled out midway through the quarters against Andy Murray at the Australian Open, then lost to Robin Soderling in the fourth round of the French, obviously playing with a lot of pain. It was the tendinitis in both knees that was the problem. He stayed away for much of the year and came back to win Abu Dhabi in January 2010. That year, Nadal also won the French Open, Wimbledon and the US Open. In 2016, Nadal lost in the first round of the Australian Open to Fernando Verdasco in five gruelling sets, and at the end he could barely hold his racquet. He struggled through a few more tournaments and went into the French Open with a lot of hope for his fans. But behind the smile, he was hurting. Finally, before the third round, he was forced to withdraw from the French Open admitting his wrist was giving up. The fact that he came back for the Olympics, got to the semis of the singles and won the Gold in the doubles, has much more to do with his absolute dedication to his country than with his recovery. Injury. Australian Open, French Open, Abu Dhabi Championship. That is a sequence of events that Rafa’s opponents would do well to pay a lot of attention to. And if you are a Rafael Nadal fan (as I unabashedly am), you have to believe that seven years on, the stars are all perfectly aligned for a repeat of 2010. Paris, London and New York beckon for Rafael Nadal.